Gary Horstkorta contributed photos and info on this storied northern California airfield course. "Occasionally, the track was lengthened to 2.5 miles for enduro events, by using a portion of the fourth leg and a paved service road." "Primary useage was for the annual Racing Drivers Club (RDC) drivers school; the year end RDC Enduro; SF Region SCCA club events; SCCA diviisional, regional and a few national events. First race was in May, 1957 with Carroll Shelby the winner in a 4.9 Ferrari. The track continued in use through much of the 1960s but saw dwindling use when Sears Point opened in early 1969. It was finally closed and purchased by a real estate developer in 1972." "Unlike Vaca Valley Raceway, nothing remains of Cotati today. The entire track area was plowed under and replaced by a mobile home park, shopping center and industrial park. One side note, Steve McQueen rented the Cotati track during the filming of Bullitt in 1968 for practicing the chase scene." "The original Golden Gate Race Circuit was the name give to the road races through Golden Gate Park in SF, 1952-54. 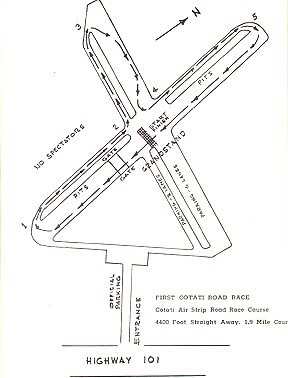 After Cotati opened in 1957, they used the name for various events, usually the more important regional or national races. For SCCA club events, it was simply Cotati."